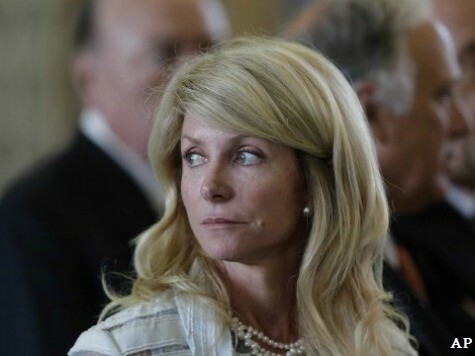 Despite promises to the contrary, it appears that State Senator Wendy Davis (D-Fort Worth) voted on bills that affect her clients and favorably impact the bottom line of her law firm. “I have never done anything in a way that represents a conflict in my voting and something that would benefit me personally,” she said in an interview, but state records seem to tell a different story. Records show that during the 2011 legislative session, Davis was billing her client for condemnation work (private property being taken from its owners for public use) on the very same day she was voting for toll-collection authority legislation that was backed by her client, the NTTA. This is not the only example put forth by the DMN. Senator Davis’ office sent a letter to the Texas Department of Transportation (TXDOT) requesting clarification as to the qualifications necessary for a company to be certified as a minority-owned business. Deidre Delisi, former chief of the commission that oversees that department told DMN, “We got right on it” because a senator was asking for the information. Less than one week later, another Fort Worth law firm announced it had hired Sen. Davis to “assist clients in regulatory, public policy and legislative issues.” They even listed her Senate office in the contact information. It was just a few weeks after that when Davis and her colleague Bryan Newby filed papers with the Texas Secretary of State’s office to form Newby Davis as a minority owned business. Newby is black and previously served Governor Rick Perry as general council. They indicated one of the goals of the new firm was to help NTTA with spreading legal work around Fort Worth using minority-owned businesses. The DMN article contains many more examples of what some might call ethical issues related to the Senator and her dual roles as a legislator and private attorney. One of those is an account of her sending a letter on Texas Senate letterhead to the U.S. Transportation Secretary, Ray LaHood, requesting federal funds for an NTTA project – her law firm’s client. The project was to build a 27-mile toll road from Fort Worth to Cleburne. Nov. 5, 2008: Wendy Davis is elected to the Texas Senate. April 6, 2009: Davis opposes a North Texas Tollway Authority-backed bill to give local tollway authorities right of first refusal to build toll projects. Feb. 25, 2010: Davis’ Senate office asks the Texas Department of Transportation for information about qualifications for certification of minority-owned businesses for highway contracts. March 2, 2010: Fort Worth-based Cantey Hanger law firm announces it has hired Davis. March 22, 2010: Davis and Bryan Newby, a former chief of staff to Gov. Rick Perry, form a minority-owned law firm, Newby Davis. June 10, 2010: Davis writes to U.S. Transportation Secretary Ray LaHood seeking federal funding for the Chisholm Trail Parkway project. The law firm handling the project is Cantey Hanger. Feb. 1, 2011: Sen. Jane Nelson introduces a bill to cap fees charged to drivers with unpaid tolls. March 17, 2011: NTTA’s legal services committee approves hiring Newby Davis to do land-condemnation work for the Chisholm Trail Parkway project. March 23, 2011: Davis drops her version of a fee-cap bill and signs onto Nelson’s bill, which has NTTA support. The bill sets the fees regimen that would be the starting point that law firms subsequently hired by NTTA would use to seek settlements. March 29, 2011: The Senate approves a measure supported by NTTA to give local tollway authorities right of first refusal to build toll projects. Davis votes for it, saying it’s better than the version she opposed in 2009. May 27, 2011: Newby Davis begins billing NTTA for work on the Chisholm Trail project. In the Senate, Davis votes for Nelson’s fee-cap collection bill, which goes to the governor, who later signs it. Aug. 15, 2012: NTTA chooses Newby Davis as one of six litigation firms to collect fees and delinquent tolls. Aug. 30, 2012: Davis subcontracts with a Chicago collection agency to handle delinquent toll and fee settlements. In the race for Governor of Texas, Davis and Texas Attorney General Greg Abbott, her Republican opponent, have both made ethics an issue in the election. Just last month, Breitbart Texas’ Michael Quinn Sullivan, reported on Abbott’s plan to stop unethical legislators from profiting from their position as a legislator, like Davis appears to have done in the examples above. In this article, Sullivan said Davis and her partner, Newby, seem to have created a law firm almost exclusively out of working for government entities, including work as bond counsel. The Davis campaign has yet to respond to Breitbart Texas’ request for a response to these allegations.